The Bechdel Test is a blunt but enduring tool used in feminist film criticism and analysis for 30 years to check for the representation of women on screen. C) something other than men. The fact that this very basic minimal benchmark is still often not met means that, despite attracting criticism for its limitations (more on this later), the test is still a frequent provoker of debate. In the decades since it was conceived, in a light-hearted 1985 comic strip (below), to highlight the lack of women characters in film and the desire of women to see our own gender on screen, the test has remained as a starting point for wider and more in-depth discussions. By drawing attention to the problem of underrepresentation – still as relevant as ever, the test encourages the film industry to take steps, however small, towards positive change. How does it apply to theatre? It seems worth considering whether the theatre industry- suffering from similar problems of underrepresentation noted in the worlds of film and TV, could benefit from Bechdel testing its play scripts. 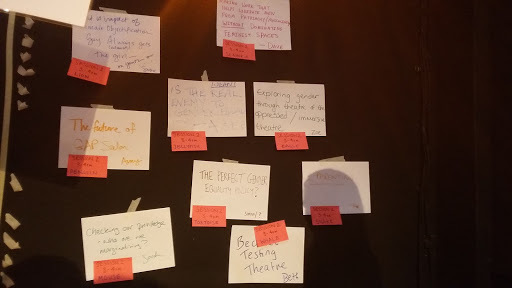 At a recent Open Space event organised by GAP Salon and Devoted & Disgruntled at Camden People’s Theatre on the topic of gender in theatre, I raised the question for discussion, of whether it would be useful to apply the test to stage scripts as well as screen. The question was prompted by recent practical applications of the test reported in the media: Swedish Cinemas introducing a Bechdel ‘rating system’ in 2013, and this year’s Bechdel Test Fest screening and celebrating films that pass with flying colours. These initiatives to highlight representative films changed the way the test was considered- as an interesting, sometimes funny, occasionally confounding, red-flag for (self-confessed) frustrated feminists. The test has long provided fuel for complaining rants, but applied with a slant that highlights positive examples, it has potential to induce more practical consideration of solutions. When the test flags up the ‘passes’ rather than the ‘fails’ it seems the media, the public and the industry start paying attention, audiences and creators feel empowered to work together towards greater representation rather than merely bemoaning its lack. In the theatre industry good intentions are already being expressed to increase diversity, and change is evidently more immediately possible in our fast-adapting industry, with race-blind casting, all-female productions and female-led shows already far more prevalent (though still with a way to go) in mainstream theatre than in film. 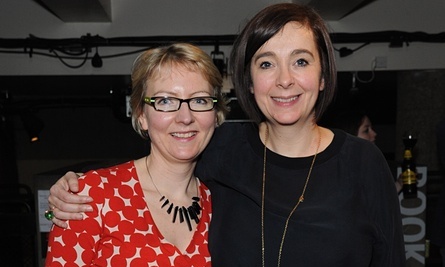 If initiatives similar to the Swedish ratings system and the Bechdel Test Fest were to exist in this industry, it’s not hard to imagine that the ‘trickle up’ could be a speedy one, from a grassroots fringe theatre idea to a standard topic for consideration amongst major West End producers. What about the problems with the test? There are three main issues that have aroused debate over whether the test is a useful indicator of equality and diversity in representation – debates which have lead to some interesting Bechdel-inspired alternatives, and adaptations of the test. The problems with the test reflect the depth and range of problems with the industry (and society!) that the test on its own is not wide-reaching enough to address. These limitations in themselves provoke consideration of issues related to and beyond the test itself which should and will continue to be discussed at length wherever the test is applied, and can do so without invalidating the usefulness of the test as a simplified starting-point. The test is not an indicator of how feminist or sexist a script or characters may be, but a simple method for identifying scripts that are not entirely male-centric. It does not address how women are represented, but purely asks whether they are present at all. 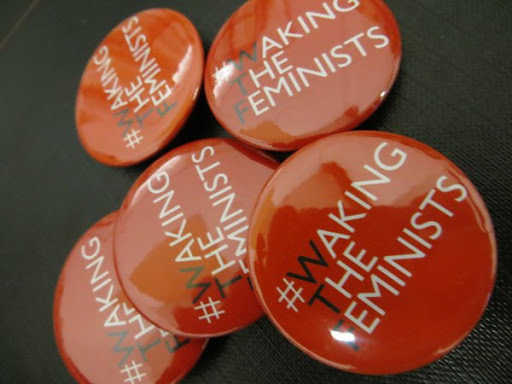 The test is a food-for-thought first-step into more in-depth feminist analysis, gender awareness, and other equalities issues that could play an important part in extending the discussion beyond those of us already engaged in the representation conversation. The test is limited to gender-checking, and does not cover other areas where representation is just badly lacking: race, disability and size being a few. It also assumes a gender binary whereby all characters are identified as male or female, without considering characters that may identify as transgender, gender-fluid, gender-neutral or any other possibilities. Many of these issues are to do with actors than characters, and diversity can be increased by looking at casting and using methods such as blind-casting or quotas, at a later time than the writing or script-development stage where the Bechdel test focuses its attention. Regarding the question of non-binary gender representation it may be useful if the reference to ‘female characters’ is interpreted as a flawed/outdated simplification meaning ‘female-identifying characters’ or ‘non-cis-male characters’. Even without that qualifier, it may be argued that by encouraging the representation of characters who aren’t depicted entirely in the context of their gender (binary or not), is a small step towards greater representation of characters as complex humans rather than simply males or females. The test does not expressly take into account cross-gender or gender-blind casting, one woman shows, silent or non-verbal performances. 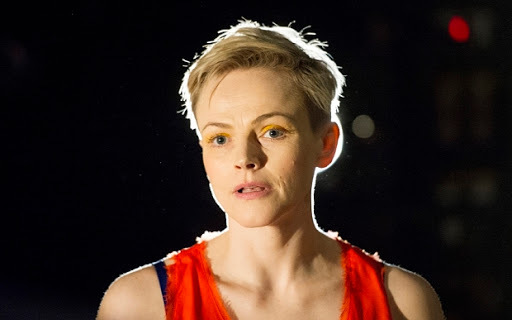 There are a number of caveats that can be taken into account when flagging up a show that passes, some examples mentioned so far include: one woman shows featuring 2 female characters mentioned talking, if not shown; 2 female performers in non-verbal communication, adaptations where previously male characters are played as female-identifying. 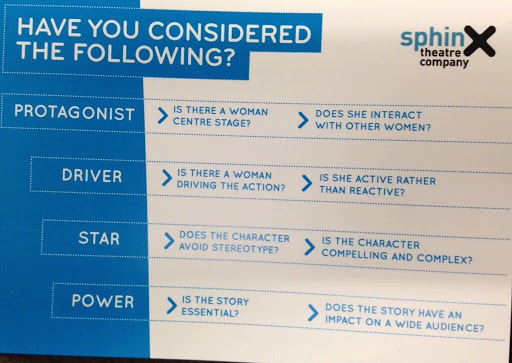 Many of these ideas are theatre-specific and hopefully will be debated at length as part of the process of searching for Bechdel passing shows on stage and scripts on shelves. 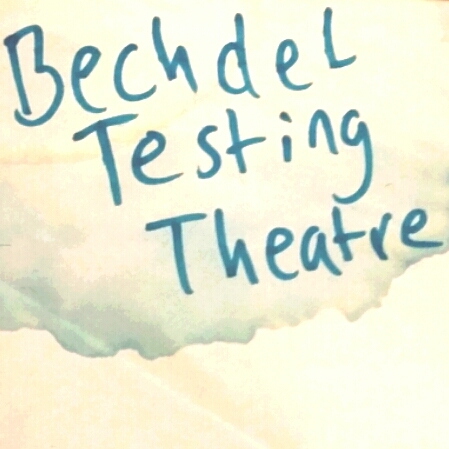 Since the discussion of the Bechdel test’s relevance to theatre, in a room full of creative feminists at Camden People’s Theatre, attention has been brought to existing groups and individuals already using the test, or derivations of it, to facilitate more Bechdel-passing performances: Sphinx Theatre have created their own ‘Sphinx List’, a tool for writers that goes deeper than the original tes, designed to help writers create scripts with that put women centre stage; Whoop n Wail Represents… is a new-writing night that has staged 3 successful show-cases of plays that pass the test. The first stones have already been laid in building a movement to use the test as a positive tool to increase representation of women in theatre, and a number of ideas have emerged in the past couple of weeks for developing practical ways to apply the test on and offline. 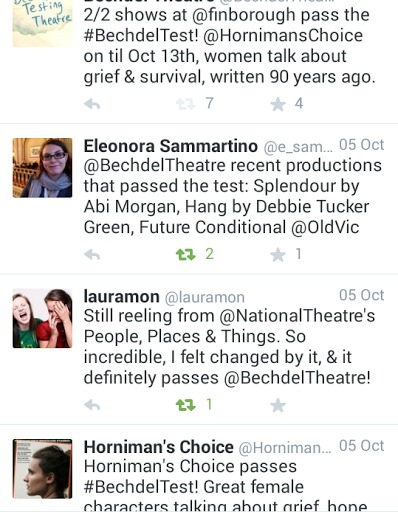 Beginning online with a twitter page @BechdelTheatre designed to note & promote current productions that pass the test, has started to gain followers and raise awareness amongst audiences and reviewers. Twitter is a great tool for connecting theatre-makers with audiences and each other. 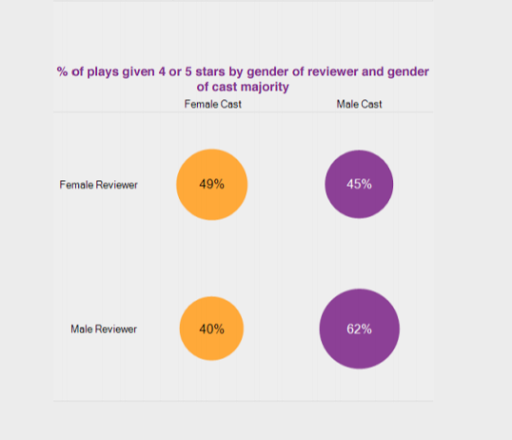 Putting the criteria for the test in audiences’ minds and pooling the crowd-knowledge of gender-aware audiences to assist fellow theatre-goers seeking more representative shows, and if used extensively will let theatre-makers know when audiences appreciate seeing autonomous women on stage and want to see more. Inspired by the bechdeltest.com mission to list all films that pass or fail, in order to highlight the scarcity of women on screen, the idea has arisen to compile a list of published plays that pass the test. With the more positive approach of noting only ‘passes’ and not ‘fails’, the idea is to built and maintain a searchable database for directors and producers looking for plays to stage, and actors and acting teachers seeking scenes for showcases and workshops. Beyond the crowd-sourcable task of checking and listing scripts, the job of building a complete website with the opportunity to search and add to the list, is a long-term project requiring special skills, so get in touch if you have the will and the way to help out. A festival celebrating women in theatre by hosting pop-up conversations in theatres with shows that pass the Bechdel Test. March 2016 – March 2017 Get Involved!